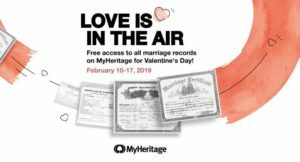 W hile our members can access the site whenever they visit the Family History Library, MyHeritage is offering an early Valentine’s Day gift. Free access to all marriage records on their site. This includes US, European, and all international collections they have. So if you have some marriages in your family still to find, take a look and see what they have from the convenience of your home. This offer runs from February 10 – 17 at myheritage.com.